Dadhich.com : Professor Laxmi Kant Dadhich is the green man of India. Professor Laxmi Kant Dadhich is the green man of India and combines in his person an Environmentalist, Botanist, Ecologist, and an Information Technologist. He is an M.Sc. in Botany, M.A.D.E. in Distance Education, B.J.M.C. in Information Technology, Ph.D. in Ecology and Environmental Science and is an orator par-excellent. He has thirty-two years' research and teaching experience. He is an academic counselor too. He has been writings scripts for Radio and TV. He has chaired the technical sessions related to multimedia technology in distance education organised by UNESCO and IGNOU.He has conducted EIS for setting up industries. He was commissioned officer as Squadron Leader in the Indian Air Force (till 1999). He trained the youth in environmental conservation, education and global scenario and taught on topics related to Aviation. He has since retired from the position. He was the Senior Coordinator for a project sponsored by the Ministry of Environment and Forests, Govt. of India on Environmental Awareness. He was the Senior Advisor to a film on Environment produced by the Reyerson, Canada. 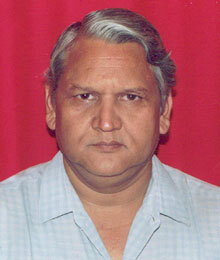 He was a Consultant with a film 'Greening the Desert' produced by the Indian Army and TV Centre, Govt. of India. He also acted as the Consultant with Multimedia Technology & Distance Education. In Singapore, he worked on Environment management plans at a Seminar/Workshop organised by IUCN and IES; in Nepal he acted as a Research Coordinator of a Workshop 'Environment Education and Attitudes towards Environment Conservation in Developing Countries' organised by ISTE. For the last 33 years he has been working closely with several research centres and universities on issues of EIA, EIS, environment protection, water quality, pollution and other related matters, and in particular he has been having exchange relations with members from ISTE, Varanasi; JAC, New Delhi; GEAG, Gorakhpur;CEE, Ahmedabad; and CSE, New Delhi. He has been providing communication consultancy in a regular manner to UNEP, ELCI, Nairobi, Kenya. He has been a Fellow of the United Writers Association of India(FUWAI), Chennai, and Life Member Fellow of the National Institute of Ecology, New Delhi. His biographical sketches were published in Reference Asia, Indo-Arab Who's Who, Indo-America Who's Who, Indo-European Who's Who, Learned Asia Who's Who, Asia-Pacific Who's Who, and 20th Century Admirable Achievers. He has published 37 research papers in journals and books of international repute and authored 11 books/reports, besides giving talks/programs telecast/broadcast by the AIR/TV. He has supervised 13 dissertations/project works/Ph.D. theses. He was bestowed upon the WEC-IIEE-IAEWP International Award by the President of India for his concept of environmental citizenship; award for Environment Protection and Conservation by the C.M., Rajasthan; Swarn Puraskar by ISCD, Rohtak, Haryana; award for imparting training to the youth for Environmental Conservation by the Environment Minister, Rajasthan; Bharat Mata award by Astro Research project, Kolkata; award for forest extension activities in Kota Distt. by the Forest Minister, Rajasthan. He received Commendations from the Director-General of NCC and from the District authorities for his work in the field of environment and youth leadership training. Honours were conferred upon him by various organisations like TEEJ, Lions Club, Thalassemia Society, Blood Bank Society, etc. He is the member of Environment Liaison Centre International, Nairobi, Kenya; Global Forum for NGO's for Natural Disaster Reduction (GFNDR) Yokohama, Tokyo, Japan; International Society for Tropical Ecology, Varanasi; Gorakhpur Environment Action Group, Gorakhpur; National Institute of Ecology, New Delhi; Centre for Science and Environment , New Delhi; Technocrat Council of India, Kota; Environment Society (Paryavaran Parishad), Kota; Society for Eco-Balance, Bhopal ; Joint Assistance Centre, New Delhi;and Paryavaran Vahini, Ministry of Environment and Forests, New Delhi. The citizens of India, Dadhich community and the world at large is proud of having such a multi-dimensional personality among them. Naturally, he has become a role-model for the young men and women aspiring to lead a meaningful life while remaining closer to the mother nature. All of us wish him a long and healthy life and should learn the meaning of an ideal life while sitting at his feet. Dr. L.K.Dadhich recently awarded as "Rising Personality of India" by the International Penguin Publishing House, New Delhi.